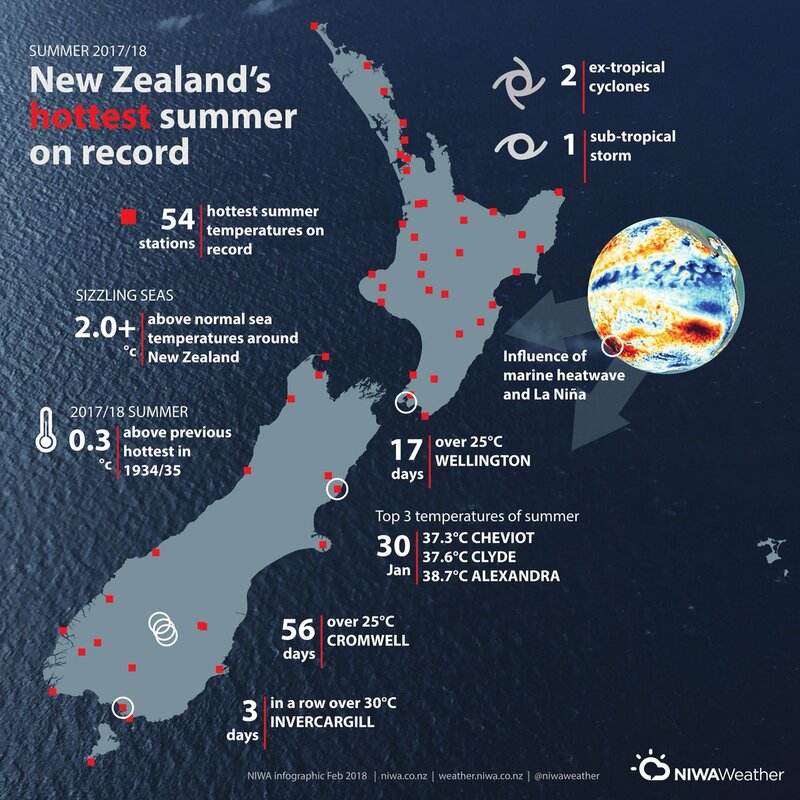 It has been confirmed what was expected and well signalled – January was the warmest month on record for New Zealand. All that means definitively is that January was the warmest month on record. It certainly seemed to be one of the most consistently warm and sometimes hot months that I can recall in Dunedin. I’ve experienced hotter, in Central Otago the summer of 1972/73 was a scorcher (and I worked through it outside most of the time), and they had another hot one this year. Dr Jim Salinger, who pioneered Niwa’s benchmark seven-station series, used to analyse climate trends, said January’s temperature had come in at a scorching 20.2C – 3C above average. “This makes it the warmest of any month in reliable temperature records dating back to 1867,” said Salinger. Final figures have yet to be officially confirmed by Niwa, which will be releasing its summary for January tomorrow. Former record-breaking months were February 1998 at 19.6C and February 2016 at 19.5C. The previous warmest January was in 1956 with 18.8C. 1956 was before my time, and 2016 didn’t seem extraordinary in Dunedin (it must have been elsewhere). 1998 is notable as one of the hottest years on record. In November, December and January, the temperature had come in at 17.7C, or 2.2C above average. The hot early summer of 1934/35 – long used to compare warm seasons to – was 17.C. “The main reason for the hot early summer and the marine heatwave around New Zealand over this period was a strongly positive Southern Annular mode, causing the storms whirling around the Southern Oceans to contract towards the Antarctic continent, with no cold outbreaks into the Tasman Sea and New Zealand area,” Salinger said. A marine heatwave also happened in 1934-35, but this period had been warmer by 0.4C, because of global-warming-producing climate change, Salinger said. The New Zealand temperature series – better known as the seven-station series – was developed in 1981, as part of Salinger’s PhD work. The stations are at Auckland Airport, Masterton Airport, Kelburn in Wellington, Hokitika Airport, Appleby near Nelson, Lincoln in Canterbury and Musselburgh in Dunedin. “These are complete since 1909, and that is why Niwa uses the records from 1909, and they have been adopted as the standard,” Salinger said. Most years this century have been warmer than almost all other years as far back as the record goes. According to Climate Central carbon dioxide peaked at 409.65 ppm in May, the highest recorded and higher than research indicates there has been in human history. However the current estimate Earth’s CO2 Home Page is 408.84, still very high, and an increase on last year (406.81). According to NASA the world keeps heating up, with July 2016 the hottest month since recordings began. The past nine months have set temperature records for their respective months and the trend continued this month to make 10 in a row, according to Nasa. July broke the absolute record for hottest month since records began in 1880. Similar data from the US National Oceanographic and Atmospheric Administration (Noaa) said the past 14 months have broken the temperature record for each month, but it hasn’t released its figures for July yet. As the string of hottest months continues, 2016 is “virtually certain” to be the hottest year on record, said David Karoly, a climate scientist from the University of Melbourne. William Trubridge has sunk to new depths (and he’s not a politician). Kiwi freediver William Trubridge has set a new world record, beating his old mark of 101m for the deepest unassisted dive in history. Trubridge, 36, reached a depth of 102m on single breath at Dean’s Blue Hole in the Bahamas this morning. He spent 4mins 13sec underwater. It is the 18th world record he has set, and comes after he fell just 10m short of the record in December 2014. That’s a long time holding your breath under water. It must be particularly difficult judging how far down you can go, and for how long, knowing that you have to get back up again. It has been a noticeably mild summer, autumn and now start of the winter. Here in Dunedin plants are budding and flowering unseasonally, there has been a distinct lack of cold southerly weather patterns, and there have been only a small number of mild frosts. Yesterday morning dawned clear and calm but with no frost, which was remarkable for the end of June. And what is being observed and felt is backed up by the numbers. NIWA says that the first half of 2016 will easily be the warmest on record in New Zealand. Scientists are warning New Zealand’s record-breaking temperatures are causing a surge in the numbers of agricultural pests and , ongoing drought, with predictions the problem is set to get worse. Findings by the National Institute of Water and Atmospheric Research (NIWA) show the first half of 2016 is shaping up to be the warmest since records began in 1909. NIWA’s findings show every month of the year to June was at least half a degree more than the average from 1981 to 2010. NIWA forecaster Chris Brandolino said if the mild conditions continued until the end of June, temperatures for the last six months would end up at above 1.3°C degrees above average, making it the warmest first six months of the year on record. The months of March, April and May were the second warmest autumn on record, and May the warmest May ever. NIWA said greenhouse gases, an increase in warm northerly winds and warmer sea surface temperatures were the reasons for the record temperatures. The Intergovernmental Panel on Climate Change (IPCC) September 2013 report found that “as temperatures increase, so do risks of serious and irreversible damage”. Individually we may enjoy it – personally I don’t mind the warmer weather – but it is raising concerns about the overall effect of climate change and the speed with which our planet appears to be warming up. This graph illustrates the change in global surface temperature relative to 1951-1980 average temperatures. The 10 warmest years in the 134-year record all have occurred since 2000, with the exception of 1998. The year 2015 ranks as the warmest on record. (Source: NASA/GISS). This research is broadly consistent with similar constructions prepared by the Climatic Research Unit and the National Oceanic and Atmospheric Administration. When most of the world’s climate scientists, and most of the climate models, and most of the climate data, and our own experiences all correlate then it’s getting more difficult to deny we have change, and the rate of change is potentially alarming.